Ex classmate BM Giriraj (he is also associate director of a movie-Moggina Manasu) has released a Kannada novel recently, called Kathege Savilla (no death to stories)- grab a copy if you can. Hot sun and other factors have cut down my travel plans in past few months and instead made me divert attention towards theatre, music and other fine arts. In the span of last 6 months I’ve attended about 10 plays/performances. I’m not an expert in this field and do not have time and content to write detailed review, so just giving a mention of various performances I attended and a brief review. Have written in detail about Swingers in a separate post- Read it here. Hyderabad based Surabhi theatre group (aka Sri Venkateshwara NatyaMandali) is reportedly one large united family of some 60+ members whose prime activity is performing theatre. They are known for on stage animations and effects, which we got to see firsthand in these two plays. Surabhi group was founded in 1889 (yes, more than 120 years) and is running since 3 generations. Everyone in the family-small kids to elderly people will have some role/responsibility to undertake during each show. Play was in telugu, so audience were provided with a synopsis in English, which helped us get a brief overview of the story. The 100 Rs ticket was full paisa vasool, while higher denomination tickets didn’t have much of a value addition. Complementary beauty products from Citibank promo, discount coupons and free perk, parrot reading etc added to fun-which we missed on day 1 but exploited on day 2. Some of the on stage animations/graphics used in these plays deserves a mention. Difficult to describe or narrate in words and should be enjoyed live. Romantic scenes involving moon and dreaming, scenes in which the rakshasa chops off his own hand and several such tricks were executed very well. Sitting at balcony we could view some accessories used for these tricks-which we wouldn’t have seen has we been on ground floor. Both Patala Bhairavi (The Goddess of Underground) and Maya bazaar (Illusionary Market??) are available as movies, for those interested. First one, Patala Bhairavi, is about a common man winning heart of princess, while having to face lots of hurdles, including an evil man who attempts to con this man and sacrifice him to Patala Bhairavi for some personal gains. However our hero gets the hint just in time, manages to escape, win hands of princess and so on. Mayaa Bazaar is a relatively weaker story. Surabhi group frequently performs in Hyderabad and other cities like Bangalore (keep an eye on Ranga Shankara schedule). Watch their next performance if you can. Forgot the name of the singer-Was a nice performance. Except a few tricks others were conventional and boring. Not really worth, mainly because we would have seen the same stuff several times over-in TV, in other shows etc. Kids might enjoy it though. Both Rebelz plays I’d seen were two in one- two short plays performed back to back. 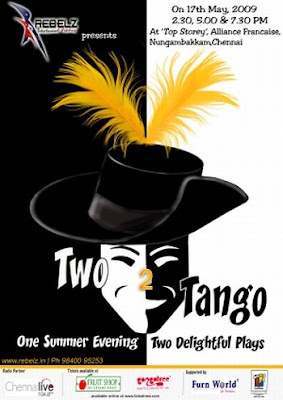 In Two 2 Tango, first play, Playwriting for Dummies, was about how a script writer tries to control the play by varying dialogues or significance of each characters. Second play, Alice in Blunderland, was about a person who had created a false image in the eyes of his boss about a strong relationship he has with his loved one, while in reality he had none. Now that his boss is visiting his place for dinner, he has to get a girl to act as his fiancée. The play depicts the trouble he faces in the process. Overall rating: Ok to Good. To be performed this Saturday and Sunday, 13th and 14th June 2009, 7PM- Watch it if you can. I’ll update this post with a brief review of this play next week. Run for your wife is A very popular play in England. ASAP productions are performing it in Chennai, with assistance from Bhoomi. Run for your wife: Post play update: The play was good, though started little late. I felt some dialogues and actions could have been toned down a little. There were no refreshments on sale during the break. Museum theatre is not the best place to perform a play-due to its semi circular design, only those sitting at the centre can get proper view. Also number of seats are much less compared to a regular theatre. Ticket prices to these shows are 2-3 times (and more) that of a movie ticket. But watching live performance is a different experience compared to viewing pre recorded video. Also some of these theatre groups are into charity and social welfare. Most of them are very successful in getting enough sponsors. Also wanted to attend performances of Ram and Indira Kadambi, Jayanti Sundar and others-didn't materialize. Great to know you watched both our plays over the past few months! Our latest play is premiering in Chennai on the 20th of June. Its called "An Idiot for Dinner" and is based on the French film "Le Diner De Cons" which was also made into "Bheja Fry", a Hindi film last year. The shows are at 3:30 and 7:30pm at Sivagami Pettachi Auditorium in Mylapore. Please do come and watch it and tell us what you think! I have it on my plan. Have updated the post with this. We are looking for an Amateur Theater Group to stage an event consisiting of variety entertainment including a smallplay, classical dance to celebrate indian Independence Day in the city of Goteborg, Sweden. the association has been just revived and finances are low. But members will be happy to host performers as their guests in beautiful Goteborg for a week. If any Group is interested, please write to us at connexxions@aol.com. Event is planned for second weekof September 2009. My group Tahatto is staging, "A Funny Thing Called War" based on the original BlackAdder comic series on 13th Nov'09 at 8pm at Alliance Fr., Bangalore. So if you do happen to be in Bangalore, please do watch the show. The show was very well recieved and audience loved it. You can read about it on the tahatto blog. You couldn't make it last time but do not miss the 3rd show at Kyra on Sunday, 27th Dec'09 7:30pm onwards.